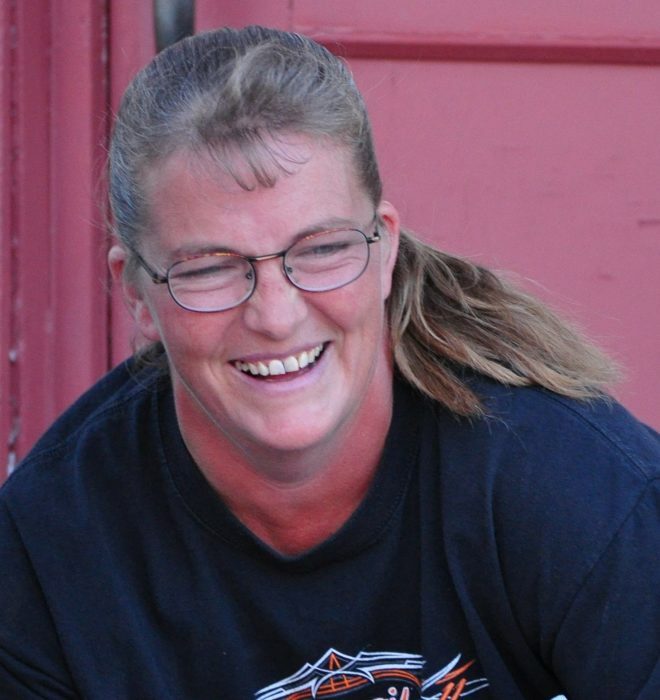 Jacinda Rae (Peterson) Wilkins, age 51 of rural Arnold passed away at her home March 21, 2019 surrounded by her family. The mother of Casey and Laykin, daughter of Jay and Jeanie Peterson and sister of Mark and Michelle fought a courageous battle against cancer since the fall of 2011. While fighting cancer she never let it get the best of her. She continued to live by the motto she lived by all of her life- to never quit and to fight until the very end. Even though obstacles were placed in her way, she would always find a way around them, over them or through them as she continued to be the strong one for her family and friends. Growing up in Elm Valley she was known to be as tough as the boys and just as hard of a worker. She loved working on the family farm, taking care of the animals and helping her dad. She was involved in livestock and song 4H groups throughout her childhood and was a member of the Morning Star Church. She attended the Tallin country school through 8th grade where she created many fond memories and made lifelong friends. She attended Arnold High School where she was active in volleyball, track and FHA. She worked at the Wildwood Tree Farm throughout high school and graduated in 1986. She married Randy Ross in 1987 and their son Casey was born. They lived in Phoenix for a short time then resided in Arnold where she worked at Coop and the Feed Store before working at Baldwins for over 20 years. She later married Noel Wilkins in 2002 at her country home and their daughter Laykin was born. Throughout her life she enjoyed working with animals, training horses, riding motorcycles, hunting, camping, holding babies, following her children to their activities and spending time with family and friends. She was known by all to be the hardest worker, toughest girl, fierce protector and someone you could always count on for help in times of need. She always had a smile on her face and a big heart. She is survived by her son Casey (Caresse) Ross, and daughter Laykin, parents Jay and Jeanie Peterson, brother Mark, sister Michelle (Tyler) Stienike, nieces, nephews, many close cousins, and aunts and uncles. The celebration of Jacinda’s life will be held on Saturday, March 30, 2019 at 10:30 am at the Tallin Church with pastor Gene Purcell presiding. Graveside services and luncheon to follow. At Jace’s request please feel free to wear jeans and bring your favorite picture for display. Memorial donations can be made in Jacinda’s name, which will be used for Laykin’s educational fund or to the American Cancer Society at P.O. Box 22478, Oklahoma City, OK 73123.